Here at Sierra West Airlines we value camaraderie with our colleagues. To kick 2018 off to a great start, the Operations Department of dispatchers, flight followers, and sales associates spent a Saturday further strengthening their team bond. 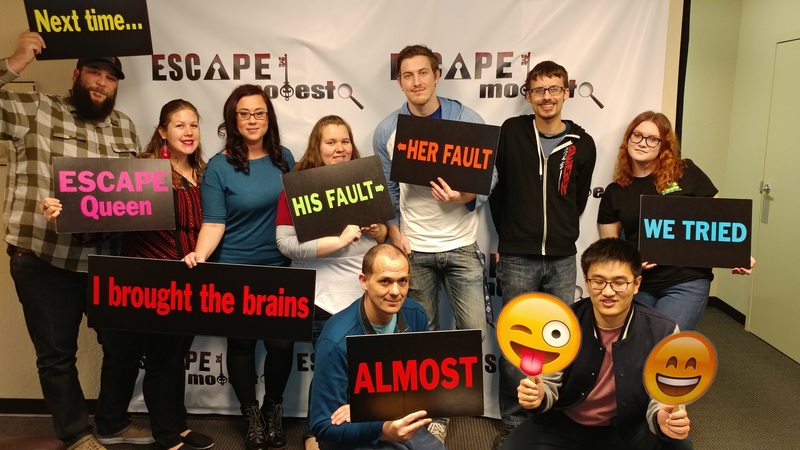 The evening started with an escape room which is basically a live puzzle; they were put in a room to communicate, problem solve, and hopefully escape. They made it to the very last clue before the time ran out… but the fun wasn’t over. After the escape room, the team then sat down for dinner at a local restaurant downtown. Below you will find a fun fact about each of the Operations Department team members to get to know them a little more. CAMERON: He holds the record at the local hospital for weighing in at 14lb, 4oz. at birth — and no, he was not late! KATRINA: She is a boy mama – with three young boys at home! ALYSSA: She makes an egg sandwich EVERY SINGLE DAY when she gets to the office (…not that everyone doesn’t know that by now). KRYSTINA: She has a 3 year old daughter and is expecting a new addition to her family in July 2018. DINO: He brews craft beer & kombucha from home. TRAVIS: While in college, he participated in pole-vaulting! LUIS: In his spare time away from the office, he likes to play guitar. LEO: He loves aviation, but he also enjoys restoring old items. His current project is working on 1993 bicycles! MICAYLA: She can play EIGHT different instruments!